Last weekend, I opened my garden gate to a class from The Phipps, who came to see what a garden might look like in September. The weather was perfect, with mild temperatures, blue skies, and a soft breeze. Poodle pup Angel Eyes was a friendly greeter and my husband played guitar on the deck so that there was live music in the garden. I love my garden every day and month of the year, and September is usually a lush and colorful display of flowers and foliage, so I readily agreed to open the gates to visitors close to the autumn equinox. Little did I know that, when I agreed to do this, the lower garden reconstruction would take place in late June instead of April and the wooden deck refinishing would be delayed until July. If you’ve lived through a home construction project, perhaps you understand the chaos and domino effect that even a small project creates. Nevertheless, I undertook additional tasks in the garden to make it visitor ready by September and though I was still tweaking things the morning of the tour, it made a good impression. See (and listen to) last year’s take on September in the garden at September Song, a song that runs through my head at this time of the year. This entry was posted in Flowers, Garden and tagged autumn equinox, fall garden, flower gardening, garden gate, garden visitors, open garden, September, The Phipps by composerinthegarden. Bookmark the permalink. Thank you, Charlie! Nice to see you stop by and comment. Thanks for inviting me in. What I see is a symphony of color and texture. I have lived through major kitchen and bath remodels. It took months to get some of the final details finished. IT IS All worth it! Hi Carol, thanks for stopping by and for leaving such a lovely comment. I actually do think of “orchestrating” the garden 🙂 Re the renovations: in preparation and execution, garden renos are very much like a home reno. The biggest difference is that in the long run, the garden is more of a moving target – change is its middle name, so one is never really finished with it. But I know that you, as a gardener, knew that! It’s very generous of you to open the garden. I know what you mean about the difference between what you see and reality (whatever that is). What a lot of work – and pleasure – this represents, and I’m glad you had a chance to share it in person, as well as online.. Thanks, Lynn, it was a pleasure, and work, to share the garden. Don’t stop looking: around the corner, for the new road or the gate. Thanks for commenting, Beeseeker – a great philosophy of life, yes? yessss, but there is always the new to be found in the familiar too. I agree. The best part of going through my garden gate is that the garden changes from day to day, the perfect combination of the familiar and the novel. I suppose that’s one of the reasons that I never tire of it. Your garden is a symphony of colours and textures! or should I say a musical tapestry? Oh, and yes, I’ll take the “musical tapestry” description- very much so! Ah, Lynn…so much of the world in turmoil and yet, here, because of your work and artistry, a reminder of what we may do with energy, gifts, love, and patience, to relieve our hearts and renew our spirits. I’m betting your guests left deeply refreshed and inspired, and that your creativity will flow through their lives in ways we can’t imagine. The world is indeed a better place for its gardens and gardeners. Thank you. Kitty. you are always so encouraging and always lead me to see things in a different light. Perhaps there is a meeting place between the act of creating something from love and passion and sharing that creation with others in a way that might lift their spirits. I certainly hope so. Thank you for stopping by and sharing your thoughts. Thanks, Bobbie – glad you enjoyed your tour! Love your garden; the path and gate you have constructed are quite amazing. A truly wonderful color palate!!! Still much green ,,, of course a variety of shades add a great deal of beauty .. personally, I love the touches the crimson leaves bring … and all this without the turning of colors. Splendid …. truly Splendid … well done Lynn! Frank, thank you for such kind words! The colors are still holding, even seem to be deepening in the cooler weather. Thanks for stopping by. That is a wonderful garden. Spectacular. And you are right-as a visitor I see absolutely nothing but beauty. Thanks for sharing, especially all of your hard work to make it so gorgeous. Thanks for your kind words, chlost; I’m so glad you enjoyed your visit! There was plenty for your visitors to see. It looks like heaven to me. Bernadette, thank you. It feels like heaven, now that Im over the “OMG, its not ready!” concern 🙂 You don’t live far away; you should stop by for a visit. I know–one of these days I hope to get a weekend day back again, I’ll let you know! 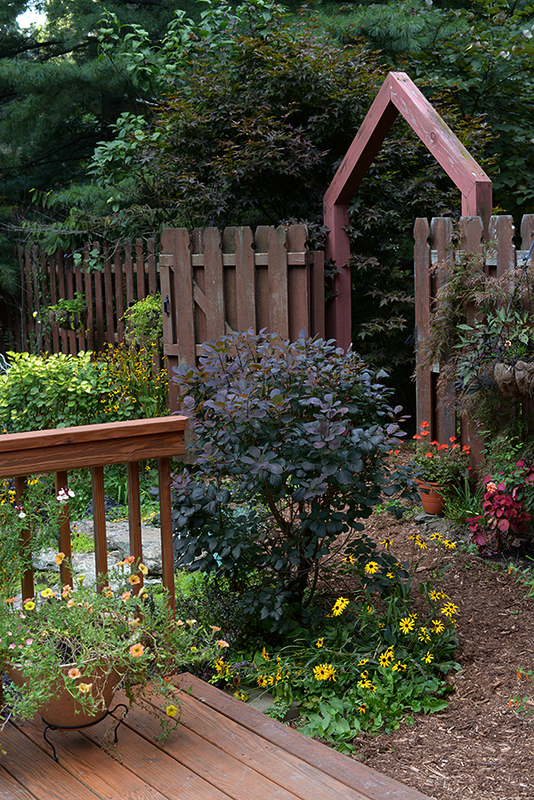 To have such a lovely garden in Sept. is a testament to your love and dedication to it! Great work!! Thanks, Graham! You know you have a standing invitation to visit and take photos whenever.